Young Women's Edition. Vocal Collection. Piece for the NFMC Vocal event with the National Federation of Music Clubs (NFMC) Festivals Bulletin 2008-2009-2010. Broadway, Movies and Disney. Songbook (softcover). With vocal melody, piano accompaniment, lyrics and chord names. 167 pages. Published by Hal Leonard (HL.740157). ISBN 0634030744. 9x12 inches. Compiled by Louise Lerch. 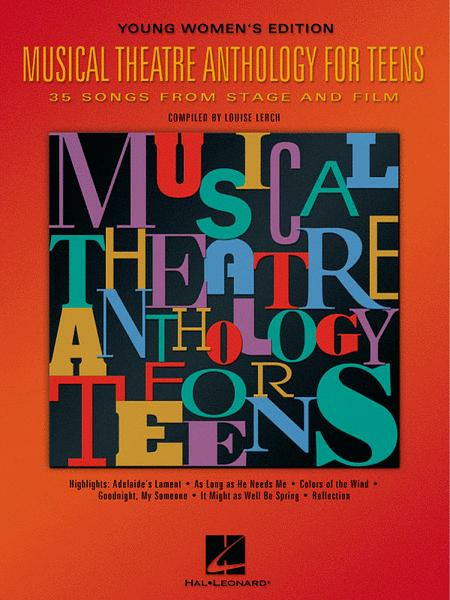 A new, three-book series of large collections of theatre and movie musical songs for teens, with no songs duplicated from the best-selling The Teen's Musical Theatre Collection. There are over 35 songs in each volume, with enough variety to keep any stage-struck teen singing for months. Songs range from the classic musicals, to Disney movies, to contemporary Broadway shows. November 14, 2008 Good book. I like this book for a solid intermediate vocalist. June 21, 2008 It helped me a lot! This book really helped me when I was jut beginning to start singing Broadway music, and now I go to a school of the arts for singing! now THAT says something! 40 of 93 people found this review helpful. still being challenging enough. If you like the songs in the book I recommend it. 39 of 68 people found this review helpful. Unfortunately, does not have the complete version of the song I needed (Shy) so I had to go to the library anyway. At least it has a lot of great ideas for songs and love the accompaniment CD. 59 of 103 people found this review helpful.